A dinner date with the girls is never just a dinner date. It a rambunctious event! 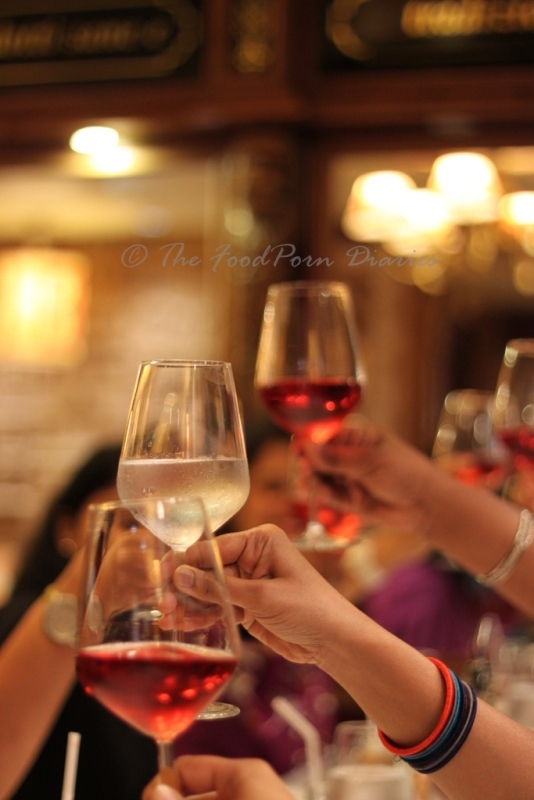 When eleven women meet for dinner, rest assured that’s where the party is! 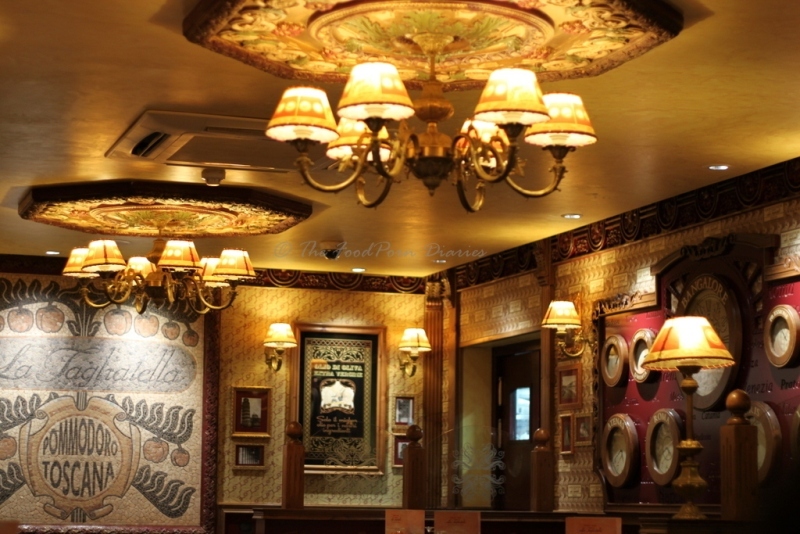 We chose La Tagliatella – the Italian chain restaurant. 100ft road Indiranagar (where else?) houses the first one in Bangalore and the second one in the country (Delhi’s Vasant Kunj was the first). I had already dined at their Barcelona outfit and was prepared to make space for huge portions and home style hearty Italian food. What I was unprepared for was completely missing the restaurant next to Sony world and driving around in circles. (That’s your hint – it’s next to Sony World!). One of the girls had called the restaurant earlier to develop a set menu for us. (Ordering for 11 can be a huge pain in the a** for both the restaurant and the diners). So we were going to have a six course meal to share with unlimited mocktails. (No liquor license yet). Bread, Salad, Antipasti, Pasta, Pizza and Dolce completed the sextet. Lets do a nice picture review shall we? Starting with the Bread. Pane della Tagliatella – The Bread basket. 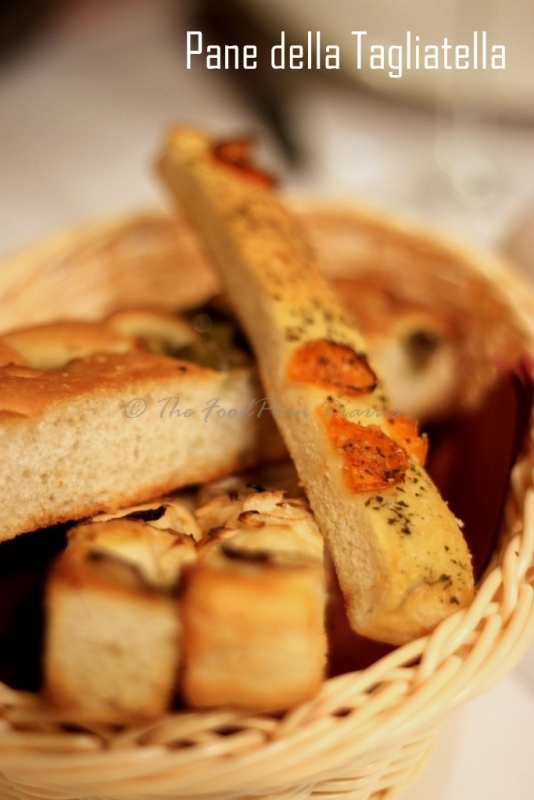 Foccacia was the order of the day – it’s an Italian restaurant after all! We had a choice of plain, rosemary or sun dried foccacia. All of it was beautifully made but the last one clearly was my favorite. And as usual, I shamelessly filled up on it. We had a vegetarian and a non vegetarian salad and this pattern repeated itself for the rest of the meal. Me being an omnivore, had the pleasure of swinging both ways. 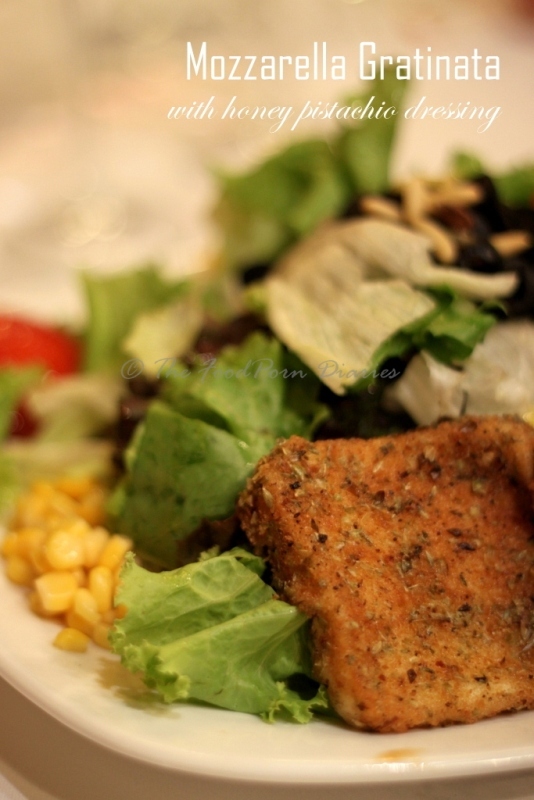 The Mozzarella Gratinata was a mixed leaf salad with deep fried mozzarella (beats the purpose right? ), sweetcorn, tomatoes, pine nuts and olives. They gave us the honey pistachio dressing on the side. The fried mozzarella was crisp and gooey at the same time and was clearly the soul of the salad. The dressing was a pleasant combination but the flavor needed to be more robust to really stand up and support the rest of the ingredients. 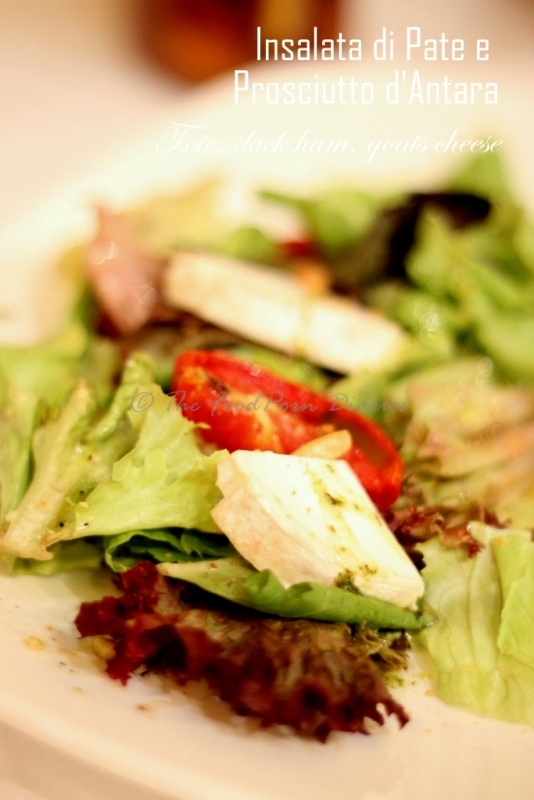 The portions were huge and if you ever walk into La Tagliatella for a light salad lunch – then this one is not for you! Insalata di Pate e Proscuitto d’Antara – Foie Gras was the star of the next one and as usual it started a debate on the ethics of it all. I have made peace with the fact that if I eat battery cage chickens then eating foie gras is no different, if not better. So I enjoyed the smooth, buttery almost melt in the mouth taste of the Foie pate served with duck ham, artichokes, goats cheese and preserved tomatoes. The pine nuts added the crunch to it and if I remember correctly they served us a balsamic vinaigrette to go with the salad. Rich, decadent and satisfying. 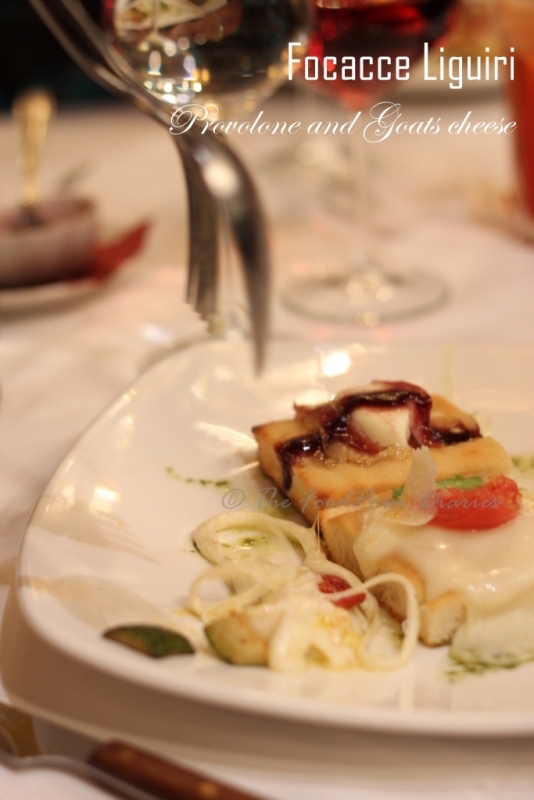 The Foccacce Liguri was a square of foccacia topped with interesting combinations of cheese. (This is where I regretted tanking up on the bread basket – when will I ever learn?!). We had one with duck ham (not very different from chicken ham actually) and Provelone (semi-hard, full fat cows milk cheese). The other one was a clear winner with Goats cheese and an onion jam – divine. The sweet and salty combo always works for me. 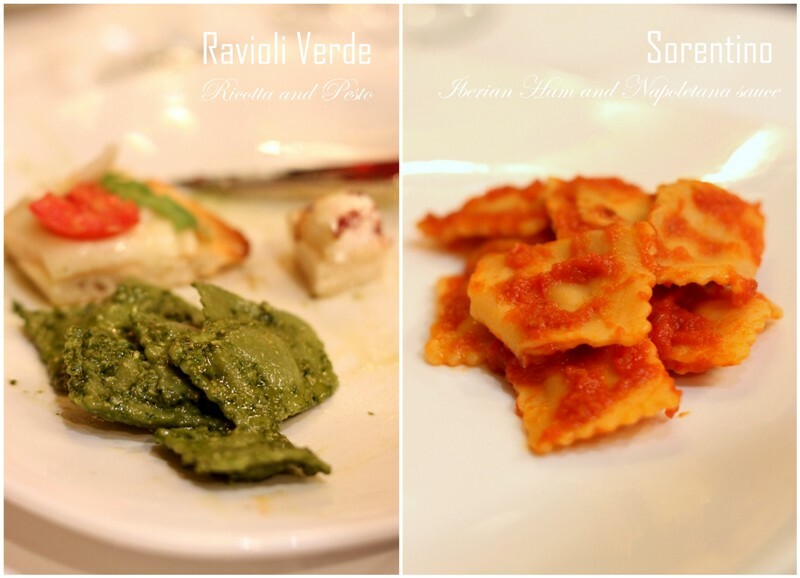 Two kinds of ravioli were followed by two kinds of pasta. I decided to try all of them. (It’s me we’re talking about – this is normal!). Ravioli Verde was a ravioli of ricotta and vegetables with pesto verde. This one I liked instantly because the pesto was so perfect. The ravioli however I found too doughy. I like my ravioli to be more delicate. The Sorentino was a ravioli of parmigiano, Iberian ham and sausage with Napoletana sauce. This was a total let down. Remember those readymade ‘ravioli in tomato sauce’ cans that you find in the supermarket? – this was a tad more underwhelming. The name promised a profusion of flavours and all it delivered was some cooked dough in a pale and barely there tomato sauce. I was done after two bites. The Pappardelle (very broad flat pasta) with Napoletana sauce was boring. I figured my problem was with the Napoletana sauce (same as marinara). It just lacked a depth of flavor. And since it was the only starring element, it just didn’t have the class to carry the weight of the whole dish on its shoulders. 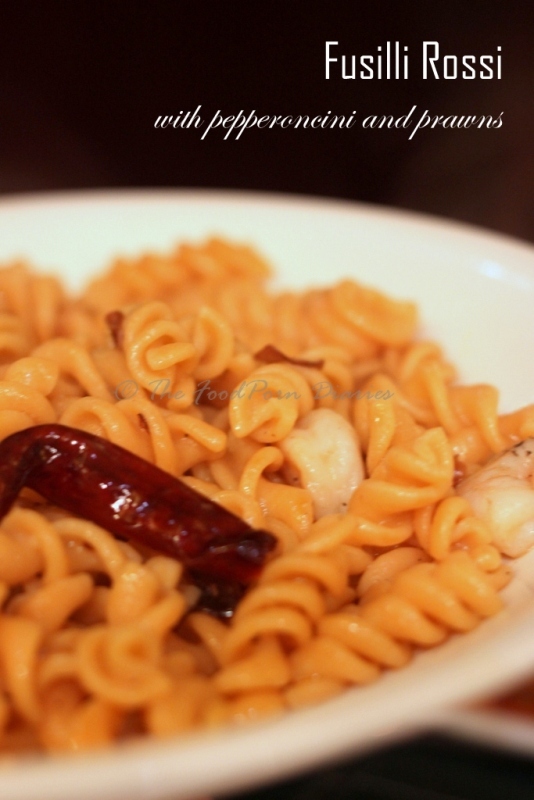 The Fusili Rossi with Pepperoncini e Gamberas (prawns, olive oil, garlic and chilli) was the saving grace. Beautiful flavors and perfectly cooked prawns (it also had calamari) made this something I couldn’t stop eating. The taste of the sea was evident in each bite, but not before casually being jostled over by the chili. A complete winner! Yes, there was main course No.2. The girls can negotiate a hard bargain! This is where La Tagliatella raised it’s scores. Thin crust, wood-fired pizzas that someone said tasted like the ones they had in Italy. And for once, the toppings were unique. 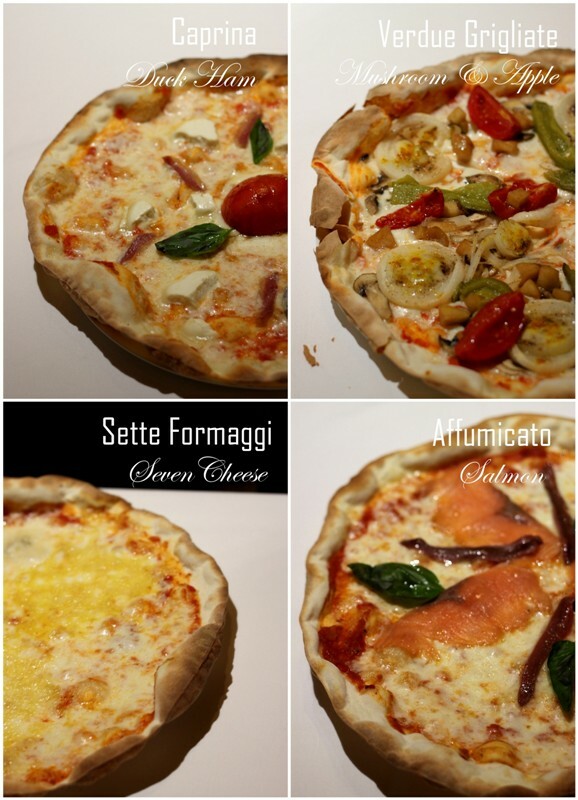 Sette Formaggi – It literally means Seven Cheeses. While I was familiar with Quattro (four) cheese pizzas, this was the first time I had tried a pizza with seven cheeses. And the interesting bit was that we could discern the taste and textures of the different cheeses without it all becoming one big cheese melt. La Tagliatella uses parmigiano, gruyere, tallegio, pecorino, emmental and mozzarella. Verdue Grigliate – This was the next vegetarian offering with regular tomato, mozzarella, onions, green pepper and mushrooms. The surprise element was the addition of apple slices which gave it a sweet crunch. Caprina – This was close to a Caprese (Tomato, mozzarella and basil) pizza but the addition of goats cheese and duck ham made it more beautiful. The crumbly texture of the goat’s cheese broke the monotony of the chewy mozzarella and the duck ham provided the right amount of umami. Affumicato – Lovers of salmon hailed this as the best pizza. With Salmon and anchovies – it’s definitely not lacking in flavor! I am a fan of neither, so I desisted from joining the brouhaha. But I can see why they would have swooned over it – delicate slices of smoked salmon glistened pink amongst the darker pink anchovies. Each bite gave you a burst of smoky, salty awesomeness that you probably can’t find anywhere else in Bangalore. If I could have only one dessert, out of a choice of three – which one would I have? If you picked option d. – you failed. Because no matter how much I love shoving my face, I like to indulge in dessert. That means going deep, taking it slow and savoring it. That again means I can’t be hobnobbing from one to the other. 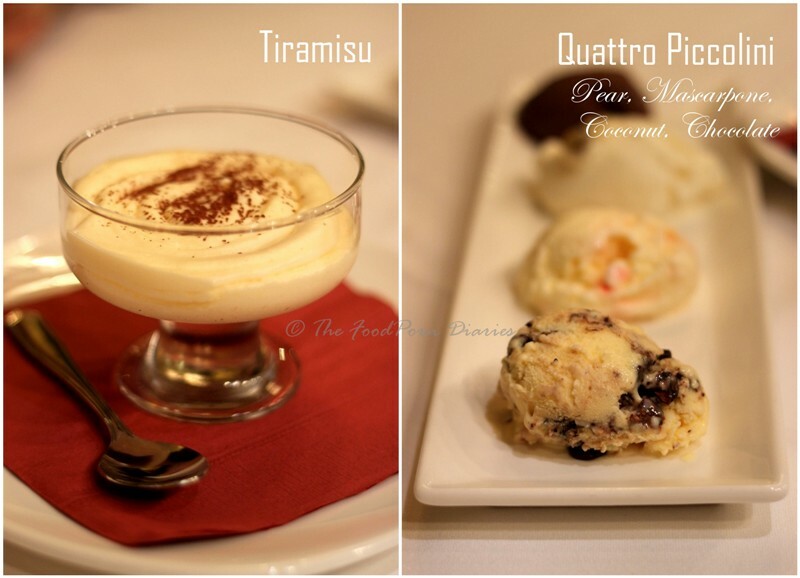 So I picked Tiramisu…what better way to finish an Italian meal than a quintessentially Italian dessert! Unfortunately, it let me down so badly that I was racing to eat the sorbetto. The Tiramisu was all mascarpone with just the faintest hint of the other ingredients (coffee soaked savoiardi biscuits, marsala and cocoa)! They could have just called it Mascarpone in a cup and be done with it. Diassapointed. (Had me craving the perfect tiramisu I ate at Chianti a week ago!) The Lemon Sorbet was refreshing, but as a fellow diner pointed out – it would have been better as a palet cleanser. The ice cream, which La tagliatella prides itself on (they import it from Italy) was nothing to shout about either. It felt dry and had an almost papery taste to it. (Maybe they need to relook at the supply chain because the ones I had abroad were delish). We went to the restaurant on a Thursday and just a couple of weeks after they opened their doors to the public. The service was bang on and courteous and I even if I attribute it to the fact that it was a slow day – I was still pleased with it. The glasses got filled magically and the plates cleared on time and fresh cutlery served with each course. Once they get their liquor license – I can see people frequenting the place for large family outings. The food tends to be a hit and miss, but with all chain restaurants the key is to know what to order and stick to it! Here I would go with their pizzas and salads. The price is on the higher side but considering their positioning as a fine dining restaurant and the quality of ingredients used – I would say it is justified. Besides their portions are quite large and almost all dishes can be shared between two people. They have valet parking and on good days you can even sit under the shade of the huge raintree and make a romatic date out of it. You’ll need earplugs to block the noise of the traffic – but who said life was perfect! I just spoke to Suresh Hinduja yesterday over dinner and we ran into a conversation about you! Small world! Yes, tagliatelle was not impressive, the company of girls glossed over the below par offerings! Best Italian for me is still Toscano. (I would not call the chef/ owner that … though he does find chatting more easy with his own kind. He's always been curteous to me). i-T-alia had its heyday when chef abhijit was running it. Though the same things are there on the menu, it's lost the spark. Good review.But it seems that for a fine-dining place, most of the dishes tried here, are of the bistro variety. I'm arriving in janmabhoomi soon, so I am curious to know what you think are the finest Italian joints in Bangalore. Coincidentally 3 years ago, I too wasted time unwittingly while searching for Via Milano in the same area as you did, but my 3 course lunch there, with frills, and an enthusiastic owner , was a good experience. Where do you think Toscano @UB city stands, and do you think there is racism there? I missed going to i-T-alia @The Park MG Road, last time and heard that its standards have dropped,but do you think it is still the best Italian in Bangalore?